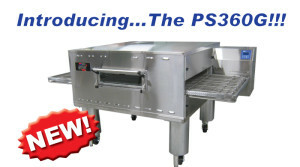 Middleby Marshall is the world leader in conveyor cooking. Middleby conveyors are not only durable, but provide a perfect bake every time. The Middleby Marshall WOW!2 conveyor series oven utilizes advanced VAF impingement technology. This technology allows the user full control of the air flow on the top and bottom of the baking chamber. End users can control the top and bottom zone air flow. The main control allows for instant results and full control of air movement, time, and temperature settings. The exterior of the oven is cool to the touch, which safely gives users cooler working conditions. The WOW² oven is designed to cook endless amounts of food products including pizza, chicken, seafood, sandwiches and more.